The problems that determine the present and future of countries and peoples are for the most part, global in character: climate change, the increasing shortage of fresh water, rising food prices and increasing relative shortage of raw materials and energy. Confronted with the globalised world, societies fell back on the habitual instrument and buttress the nation state, which only recently was declared moribund. We are now however witnessing a partial renationalisation of global politics. The world today is riddled with contradictions but there is one key contradiction I would call “the contradiction of contradictions:” The fact that between the globalisation of the world and the de-globalisation of its management a governance vacuum has been created. The UN has long since become a body that is good for dialogue but is of little use in resolving major global problems. Its Security Council is enfeebled by its diminishing legitimacy. Moreover, even on its core issue of crisis management and prevention, it is frequently bypassed or its mandates get distorted. The majority of other organisations born since World War II are experiencing similar trends. The G7 of leading industrialised countries created in the 1970s in response to the energy and economic crises of the time played a positive role in coordinating economic policies. By the beginning of the current millennium, however, just when Russia, after a wait of nearly ten years, almost became a fully-fledged member of the G7, the G8’s influence is rapidly diminishing. In the 2000s, the emerging economies of Brazil, Russia, India, China and, more recently, South Africa set up BRICS. That organisation, contrary to the numerous negative forecasts by Western experts who did not want it to succeed, is developing. The political weight of its members is increasing; but BRICS has so far done next to nothing to deal with concrete problems. In terms of filling the governance vacuum, much greater hopes are pinned on the G20, an informal organisation that brings together the 20 biggest economies of the world. Created in the late 1990s, at the start of the 2008 world economic crisis it turned into a summit of heads of state and played an indisputably positive role in preventing the collapse of global economy and panic. Yet it failed to come up with a common policy. There is a growing sense that the G20 is going the way of the G8, with more and more talk and less and less walk. The G20, like the G8, has not created a permanent secretariat or a bureaucracy interested in developing the organisation and demonstrating its (and their own) effectiveness. Without the weight of bureaucracy, institutions cannot survive in this fast-changing world. The question of the future of the leading organisations called upon to fill the “governance vacuum,” important in itself, is particularly relevant to Russia. 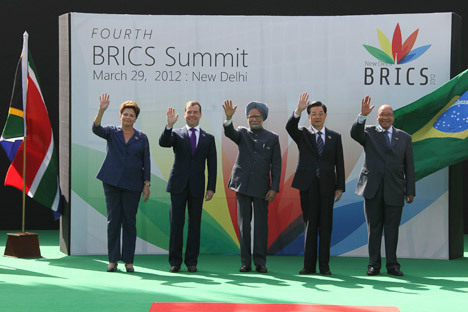 In 2013-2014, Moscow will host and chair the BRICS, G8 and G20 summits. This is a unique opportunity at least to increase the country’s international and political weight and, at most, to help fill the deepening global “governance vacuum.” I doubt that the BRICS summit will deliver a breakthrough. It is too young and is, in many ways, still a virtual entity. The G8 is obviously in crisis and in danger of fading away. But there is potential for reactivating it to the benefit of all. Russia is already prepared to propose ways to make it more effective. The G8 was created as a Western club to discuss and coordinate economic policy. For some time now, it has been drifting towards discussing geopolitics and security issues. Perhaps its geopolitical specialisation should be consolidated. To be sure, these and other global issues cannot be discussed without the two new great powers, China and India. They should be invited as fully-fledged members. A similar challenge is to develop the G20 or at least prevent it from fading away. This should be done by extending its mandate, for example, to include the problem of fresh water deficit, which is set to become the most conflict-generating economic and even political problem of the future. Russia, being one of the richest countries in terms of water resources, could initiate development of an international strategy for tackling this problem. However, the key to the modernisation of the G20 is not to add important issues to its agenda, but to institutionalise it by replacing the current unwieldy and inefficient management system with a permanent secretariat and a bureaucracy. The global economy does not lend itself to being controlled at the national level. Since it is sliding into chaos, a call for systemic governance is in the best interests of all concerned parties. Otherwise the “contradiction of contradictions” might blow up the world without any wars, or at least derail its development. Sergey Karaganov is Dean of World Economics and World Politics Faculty at the Higher School of Economics.